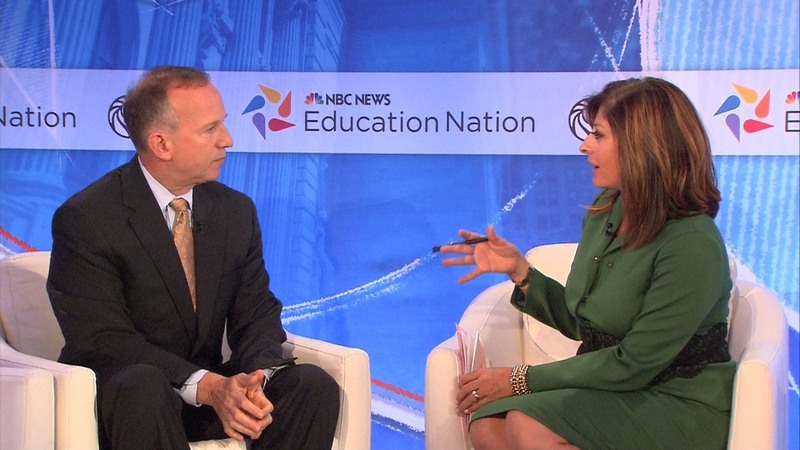 The fourth annual NBC News Education Nation Summit, held October 6-8 at The New York Public Library, explored "What It Takes" for us as a nation to ensure students are successfully prepared for college, career and beyond. 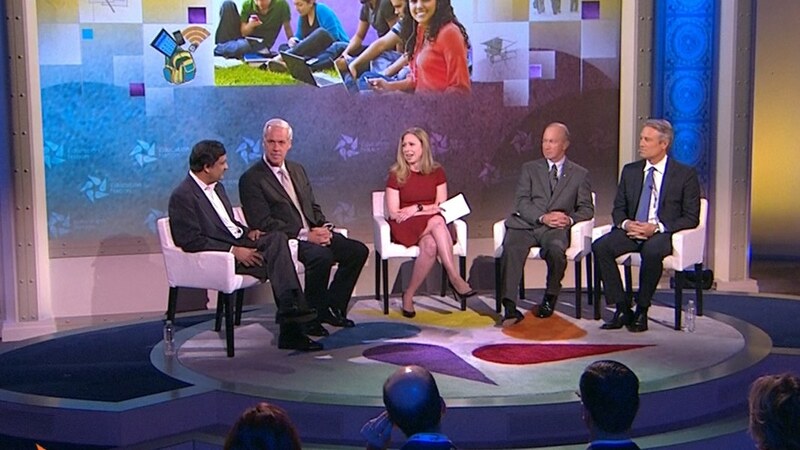 Leading experts and stakeholders – from parents and teachers, to policymakers and employers – delved into critical factors that impact students’ chances of success. 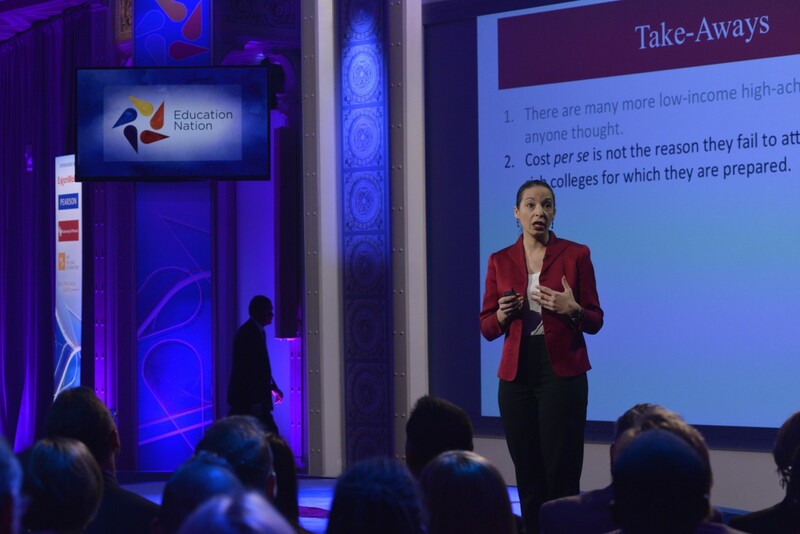 Education Nation kicked off with an Opening Ceremony, followed by the second annual Student Town Hall, the fourth annual Teacher Town Hall, and the first-ever Common Core Teacher Institute, which featured a series of workshops for teachers. 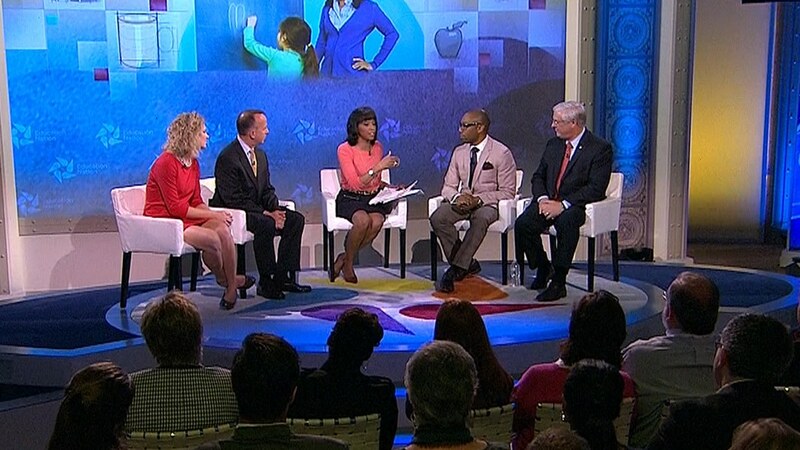 Then, the Summit featured a series of panels exploring the different elements necessary to support student success, such as a great start, well-trained teachers, and safe schools. We also shone a spotlight on cutting-edge research and thought leadership in education through a series of "Master Class" presentations. Other sessions included one-on-one interviews, remarks, and a four-part Innovation Challenge, a competition pitting four education technology startup companies against one another for a $75,000 prize. 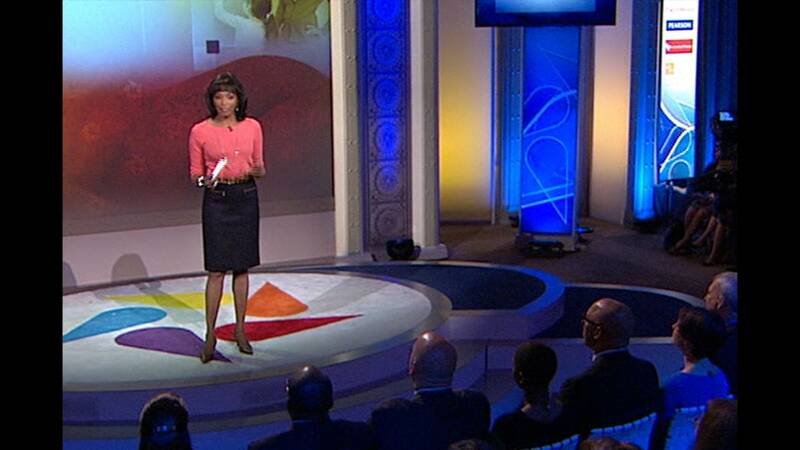 The 2013 Education Nation Summit events kicked off with an Opening Ceremony emceed by WNBC 4 New York Anchor Shiba Russell. Local students and representatives from NBC News and NBC 4 New York were in attendance. NBC 4 New York Anchor Shiba Russell emceed the event. 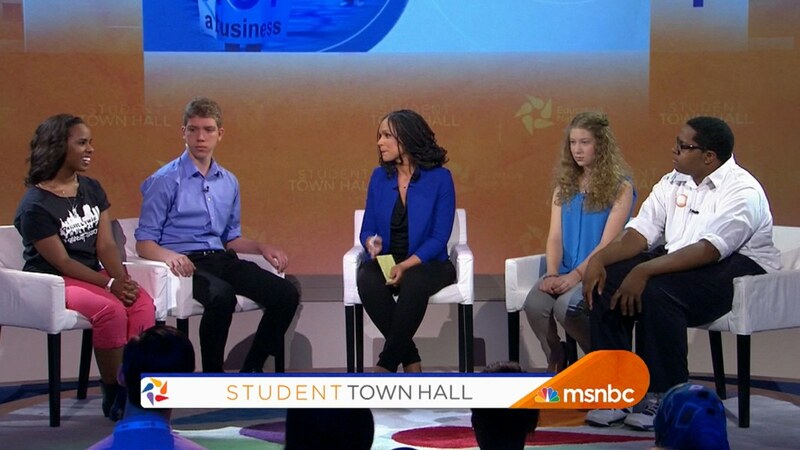 Moderated by: Melissa Harris-Perry, Anchor, MSNBC's "Melissa Harris-Perry"
MSNBC's Melissa Harris-Perry moderates the second annual Student Town Hall in which students voice their ideas and concerns about their education. Topics include performance, the new Common Core State Standards, safety on campus, student mobilization, technology in the classroom, and more. 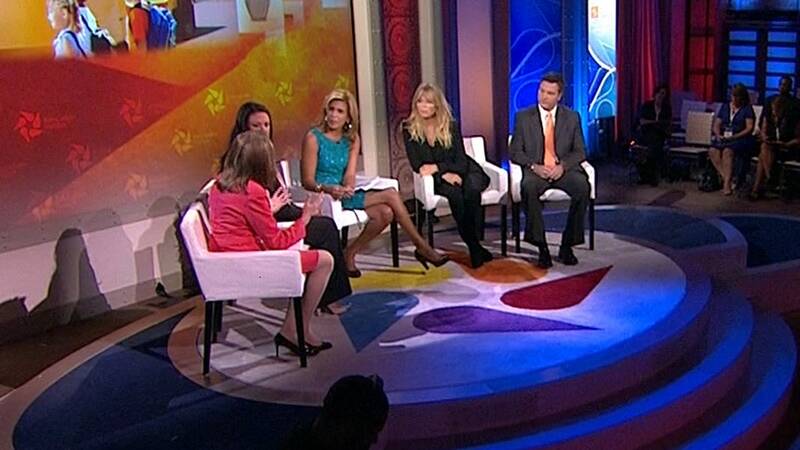 Melissa was joined in the audience by NBC News' Mara Schiavocampo and MSNBC's Krystal Ball. 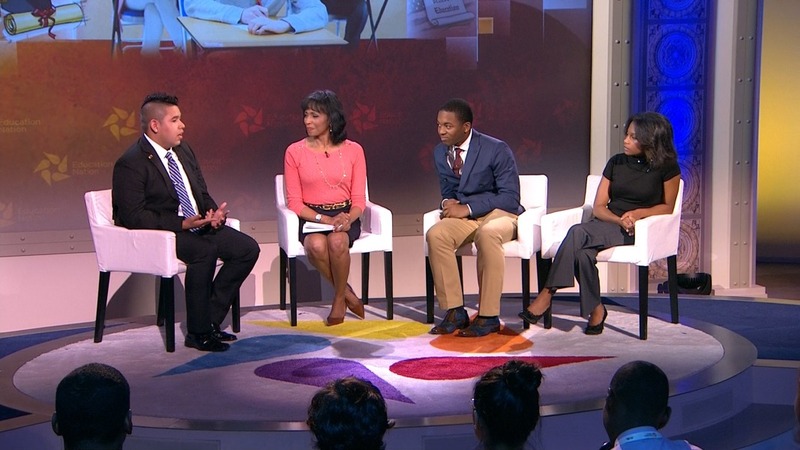 Moderated by: Tamron Hall, Anchor, MSNBC's "NewsNation"
The fourth annual Teacher Town Hall focuses on what it takes for teachers to be successful in today's school system. 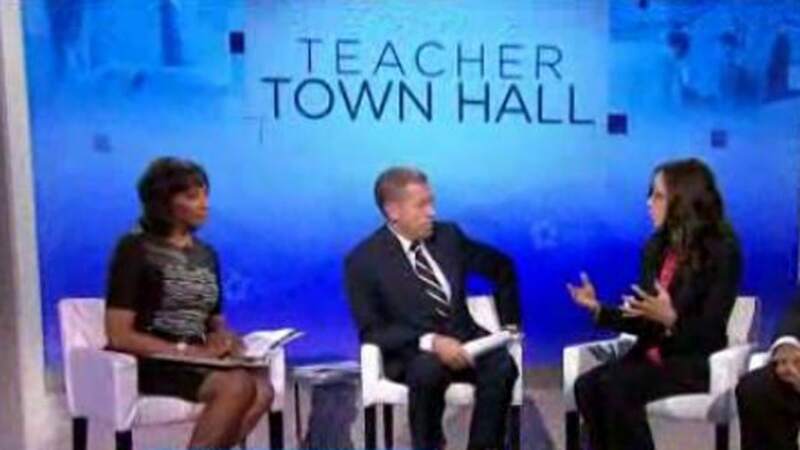 Brian Williams, anchor and managing editor of "NBC Nightly News," was joined by NBC News' Chief Education Correspondent Rehema Ellis in leading this national conversation with America's teachers. 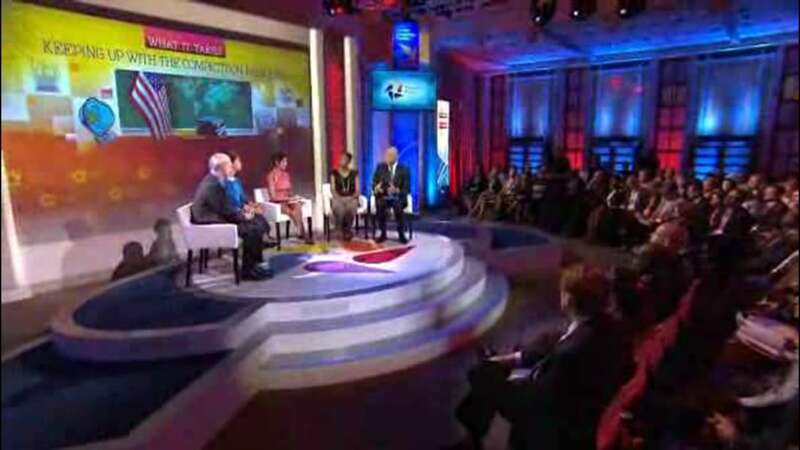 MSNBC's Tamron Hall and NBC News' Jenna Bush Hager facilitated questions from the audience. Setting the stage for the 2013 Education Nation Summit, American students from diverse backgrounds offer their perspectives on public schools in the U.S. and abroad. 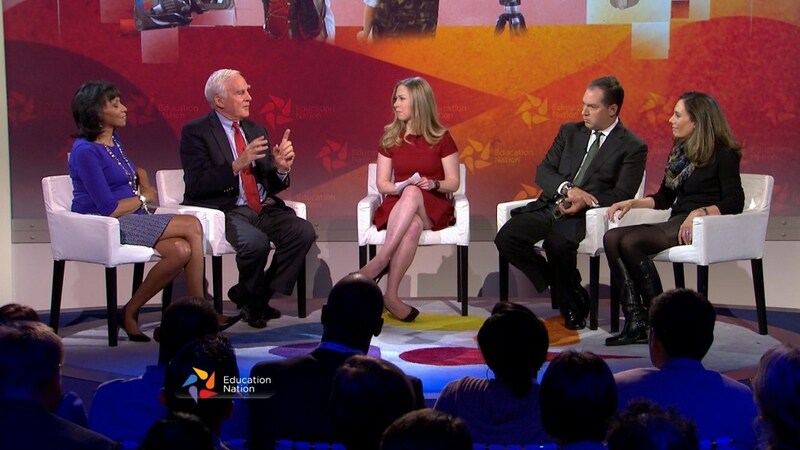 Education Nation examines the results of an Organisation for Economic Co-operation and Development (OECD) pilot project that for the first time enables high schools in America to see how they stack up against the global competition. 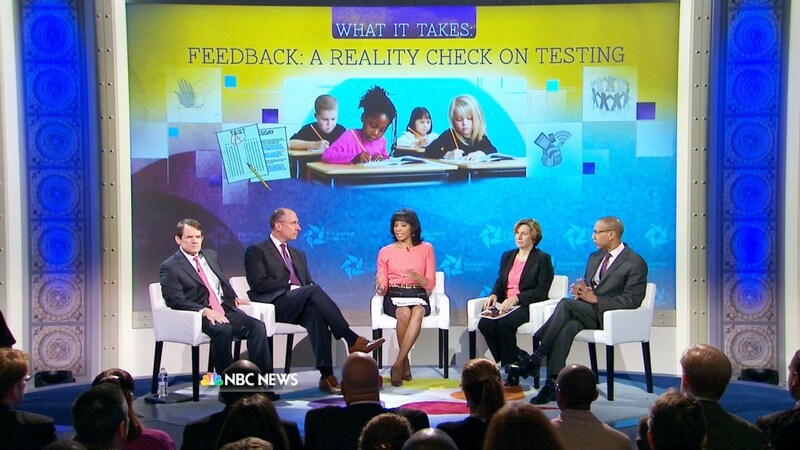 States are moving forward with implementing new assessments, but the education community remains divided on the value and role of high-stakes, standardized testing in public schools. 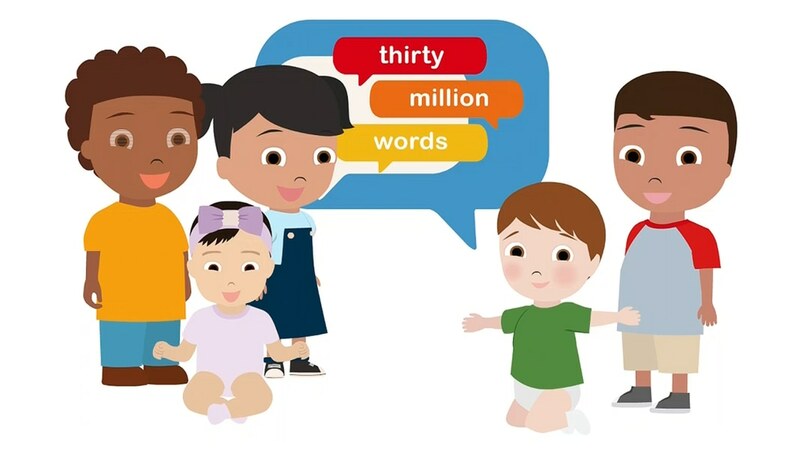 By the age of four, children from low-income families have heard 30 million fewer words than their more affluent peers. 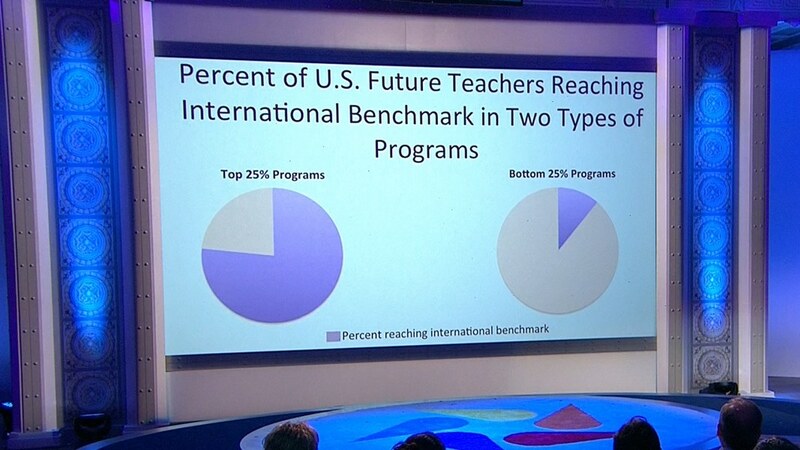 This word gap is one of the key factors driving the achievement gap. Dr. Dana Suskind's groundbreaking research explores how new technology can track children's language development and provide meaningful feedback to parents. Professor Caroline Hoxby's research reveals that most high-achieving, low-income students do not apply to the nation's best colleges and are misinformed on the true cost and quality of education options. Her findings suggest that simple, low-cost steps can substantially increase the number of disadvantaged students who apply to and graduate from top colleges. A postsecondary degree or credential is increasingly a prerequisite for jobs of the future and pathways to the middle class. 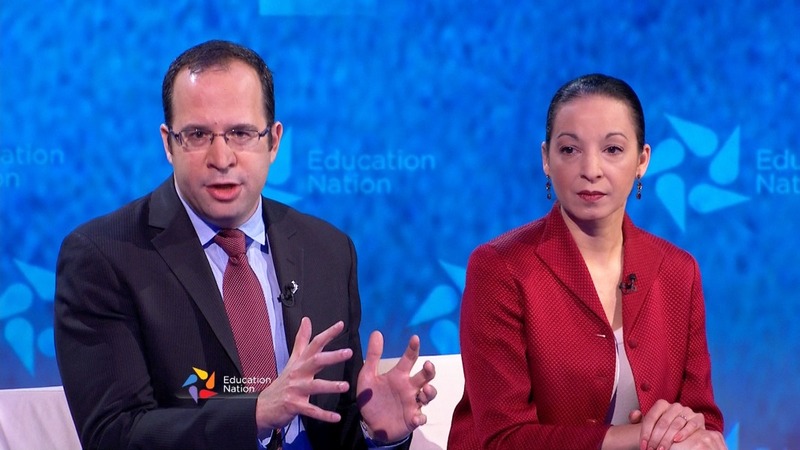 Education Nation explores strategies to make college more accessible, affordable, and attainable for all American students. 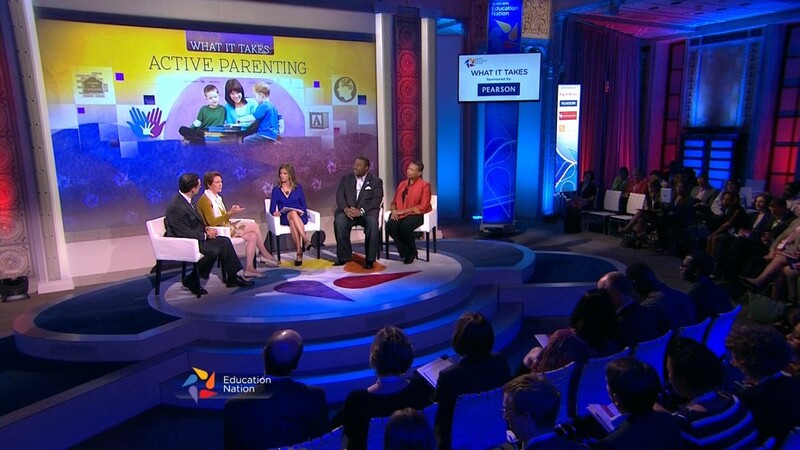 Moderated by: Andrew Ross Sorkin, Co-Anchor, CNBC's "Squawk Box"
Educators are using more technology and redesigning the classroom to offer individualized learning experiences for students. 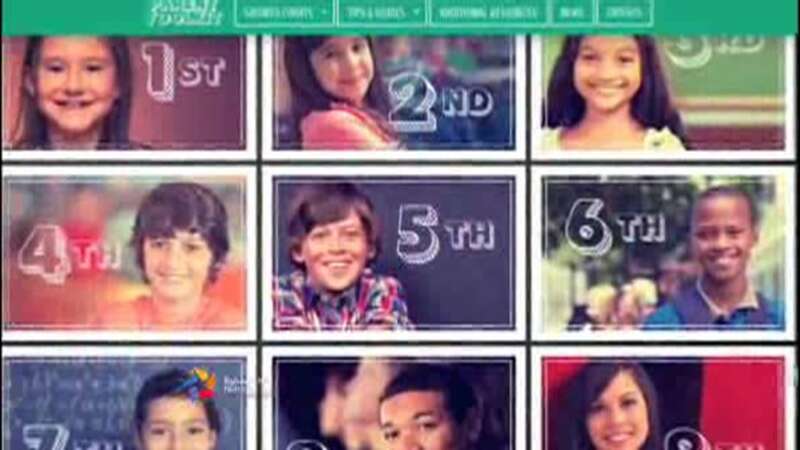 Education Nation explores what high-quality personalized learning can look like. The world has changed dramatically in recent decades, impacting how we communicate, travel, work, and share information. And yet, the U.S. public education model remains largely the same. 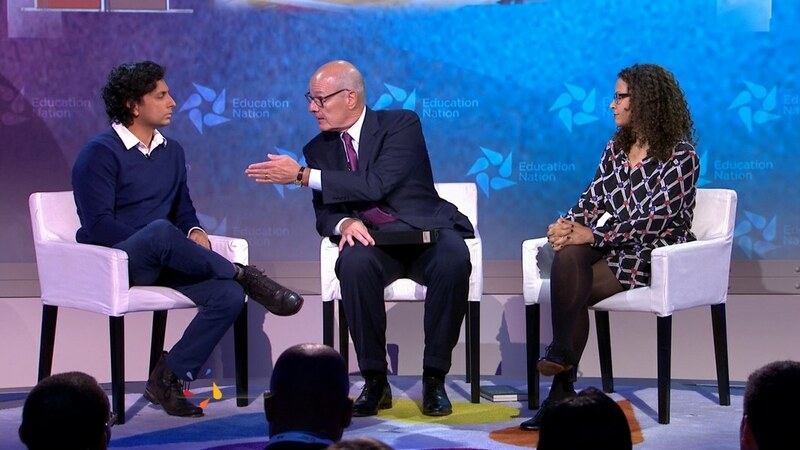 Education Nation hears from some of today's leading innovators from diverse fields about the power of disruption and transformation to help reimagine our education system. Where are we heading? Moderated by: Maria Bartiromo, Anchor, CNBC's "Closing Bell" and "On the Money with Maria Bartiromo"
New investments and innovative financing models are fueling the U.S. commitment to high-quality early childhood education. 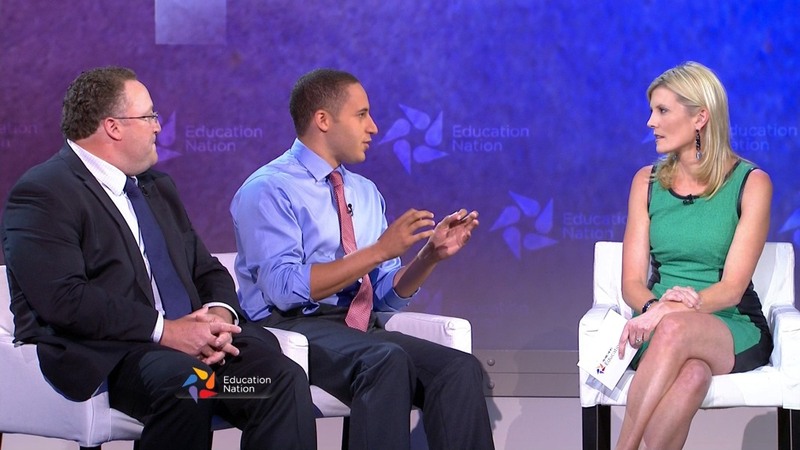 Education Nation explores these approaches and ways to ensure access for all. Reka Keller, Team Leader, Jumpstart and Student, American University, Washington, D.C.
Value Your Education: A Conversation with the Class of 2020 on "What It Takes"
Moderated by: Rehema Ellis, Chief Education Correspondent, NBC News, with Jenna Bush Hager, Contributing Correspondent, NBC News' "TODAY"
Education Nation turns to the most important stakeholders in the conversation about "What It Takes:" students. In an interactive discussion with young people who hope to be members of the College Class of 2020 and others making their way through higher education now, we hear about their academic aspirations and concerns about achieving their goals. While some American students receive a world-class education, many minority students get left behind. President Obama has called education equality "the civil rights issue of our time." 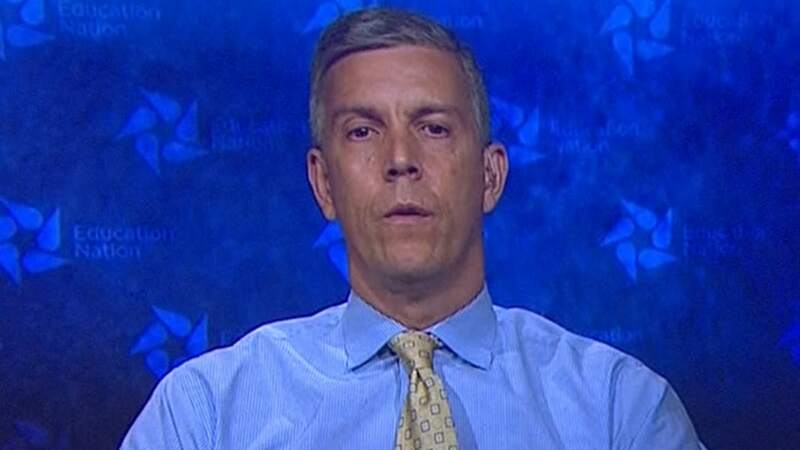 But can the idea drive education policy? 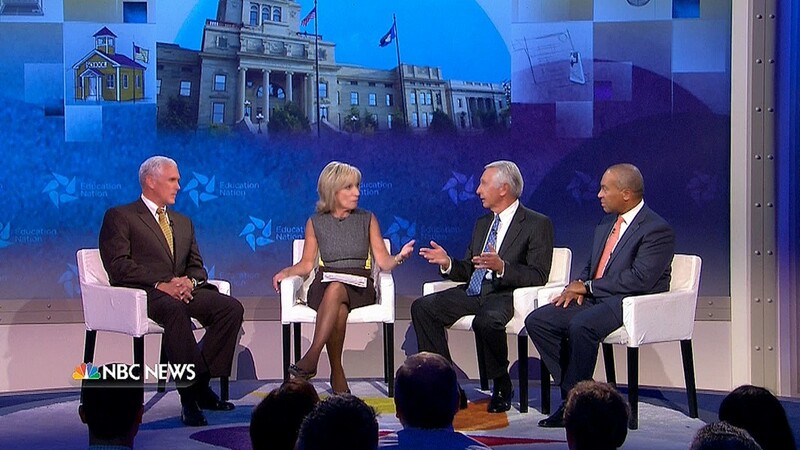 Moderated by: Andrea Mitchell, Chief Foreign Affairs Correspondent, NBC News and Anchor, MSNBC's "Andrea Mitchell Reports"
Some of the most important education decisions – from funding to standards – are driven at the state level. Our bipartisan governors' roundtable explores what chief executives from across the country are doing, in their view, to improve schools. Dr. William Schmidt's latest research sheds light on the extent to which prospective mathematics teachers graduate from schools of education with the content knowledge and skills needed to be successful in the classroom. Amid concerns that too many teachers are unprepared for the classroom, Education Nation takes a hard look at our traditional schools of education. 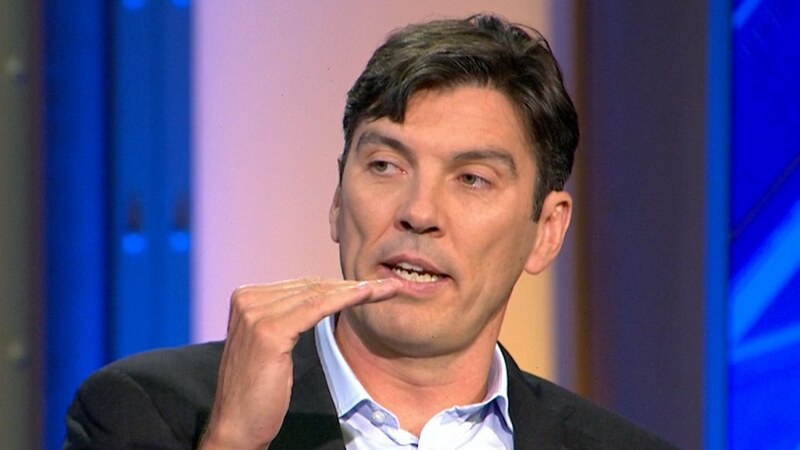 What must be done to strengthen the pipeline into the teaching profession? 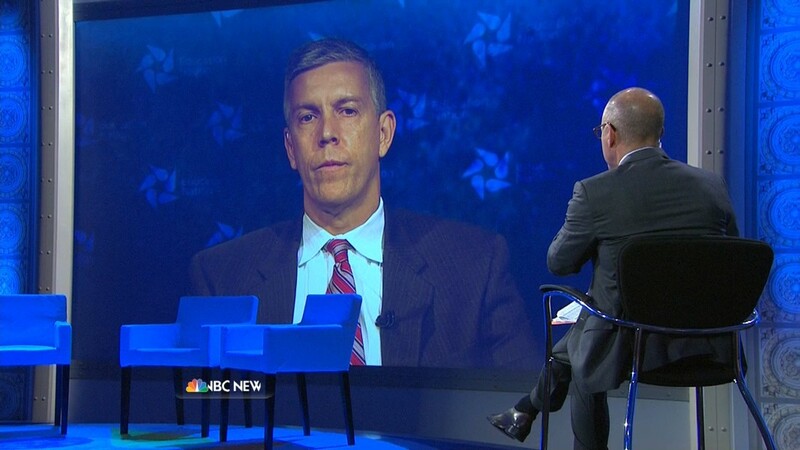 Interviewed by: Jose Diaz-Balart, Anchor, Telemundo's "Noticiero"
U.S. Secretary of Education Arne Duncan has spearheaded far-reaching initiatives including Race to the Top, ESEA waivers, and a national teacher recruitment campaign. 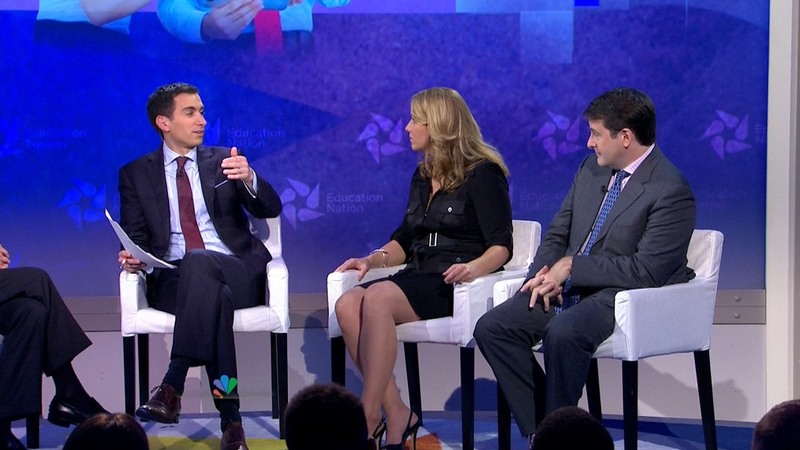 In this interview, Telemundo's José Díaz-Balart explores Secretary Duncan's priorities for the remaining years of the Obama Administration. Education Nation examines how the new technology platforms, delivery models, and credit systems of online programs change the higher education landscape. Rob Wrubel, Chief Innovation Officer and Executive Vice President, Apollo Group, Inc.
Moderated by: Erica Hill, Co-Anchor, NBC News' "Weekend TODAY"
Education Nation explores the importance of wellness, good nutrition, and regular physical activity as essential ingredients for academic and life success. 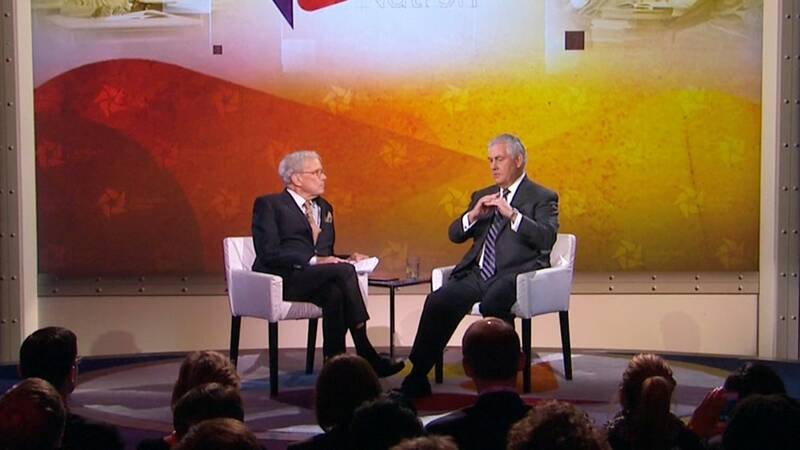 NBC News Special Correspondent Tom Brokaw sits down with Rex Tillerson, ExxonMobil Chairman and CEO and Chair of the Business Roundtable's Education and Workforce Committee, for a discussion on the role of business in promoting education reform and excellence. Research indicates arts education is linked with academic achievement, social and emotional development, and critical thinking skills. However, confronted by shrinking budgets and increases in mandated testing, schools struggle to integrate the arts. 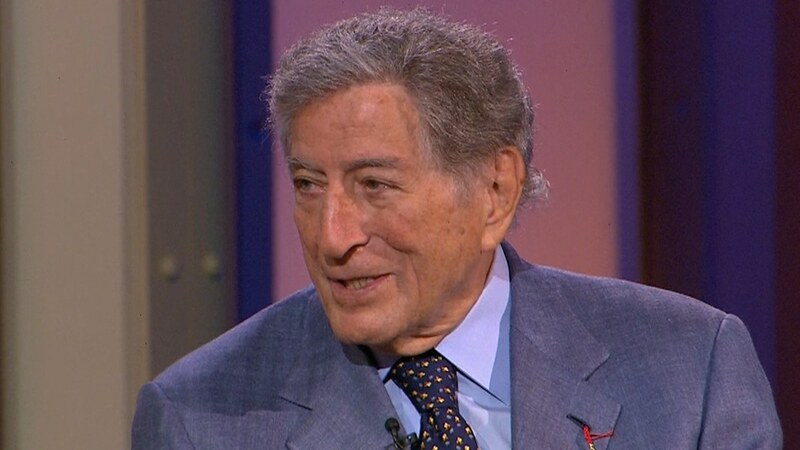 NBC News Correspondent Harry Smith discusses the role of arts in education with Musician Tony Bennett and his wife Susan Benedetto, co-founders and board members of Exploring the Arts. Under Mayor Michael Bloomberg's leadership, the New York City school system has undergone fundamental changes. 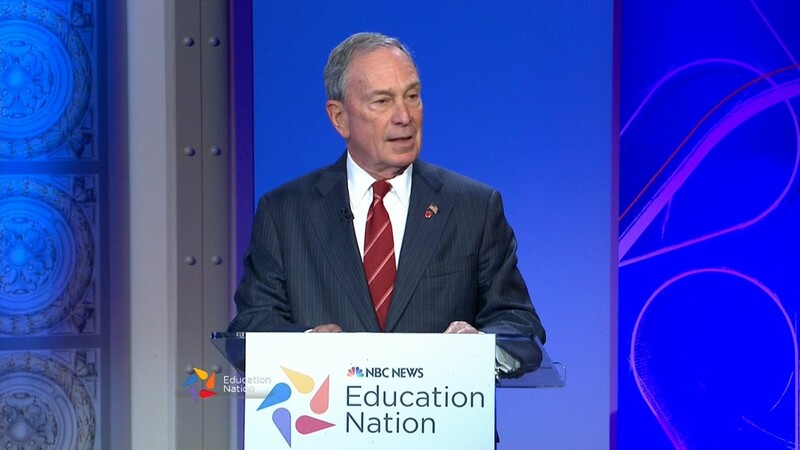 As he nears the end of his third and final term, Mayor Bloomberg addresses the Education Nation Summit on the initiatives he has championed over the last 12 years. Moderated by: Matt Lauer, Co-Anchor, NBC News' "TODAY"
The Programme for International Assessment of Adult Competencies (PIAAC) report, provides a groundbreaking snapshot of the skills and competencies of the adult workforce in 23 countries. In a global marketplace for jobs and talent, how do we grow the world's best-skilled and most innovative workforce? 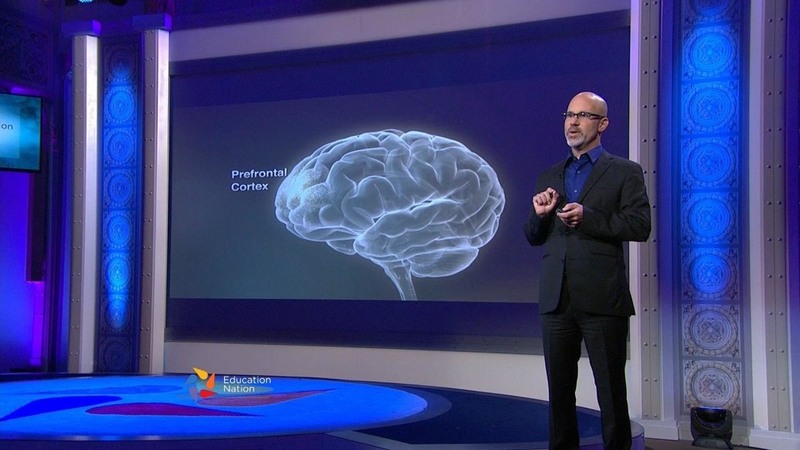 Dr. Philip Fisher's cutting-edge research reveals the power of positive interactions between children and caregivers to improve brain development. By helping children overcome toxic stress and promoting healthy brain function, these interactions can lay the groundwork for a strong future. With the onset of fundamental changes to our education system, parents need help preparing to serve as their children's first teachers and primary advocates. While districts and schools largely support family engagement, many struggle with how best to execute engagement programs and sustain initiatives over time. 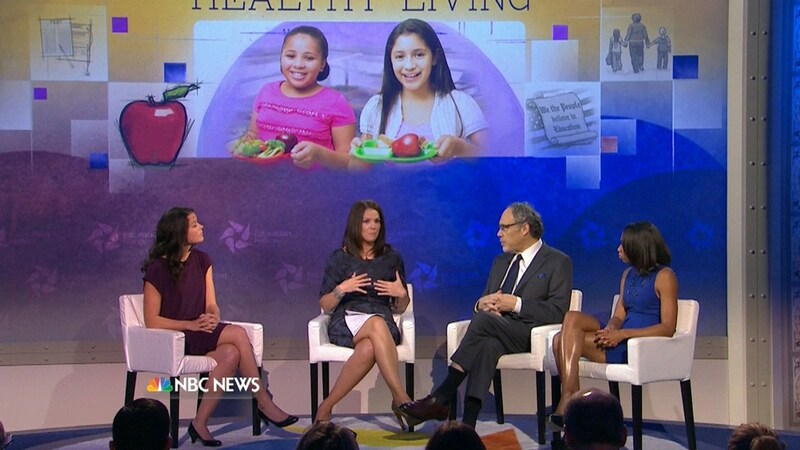 Moderated by: Natalie Morales, News Anchor and Co-Host, NBC News' "TODAY"
NBC News announces the launch of an easy-to-use digital toolkit for parents to support their children's academic success and personal growth. Natalie Morales, News Anchor and Co-Host, NBC News' "TODAY"
Moderated by: Hoda Kotb, Co-Host, NBC News' "TODAY"
Bullying, harassment, and violence can hinder students' academic success. Schools across the country are experimenting with innovative ways to teach social and emotional skills, inspire empathy, and support student safety. Dr. Pamela Cantor, Founder, President and CEO, Turnaround for Children, Inc. 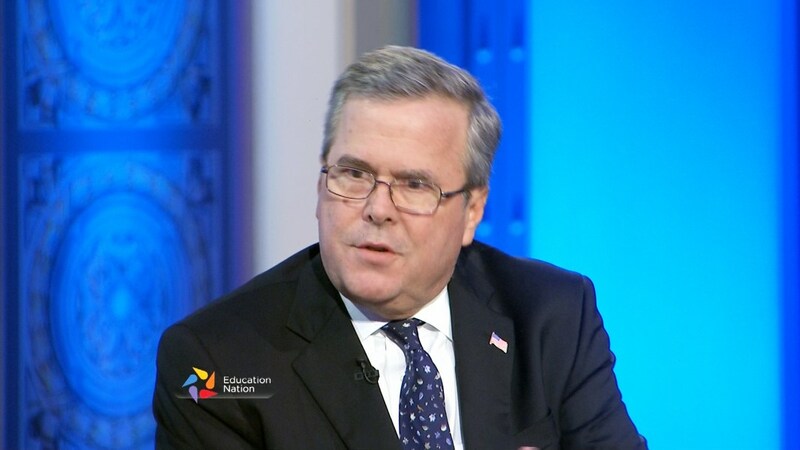 Through his role as Chairman of the Foundation for Excellence in Education, Former Florida Governor Jeb Bush champions college and career readiness, digital learning, school choice and improving literacy. 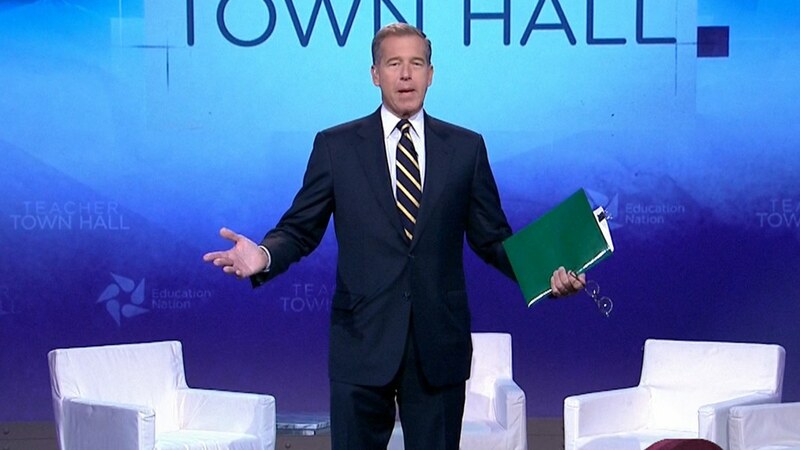 In this interview with "NBC Nightly News" Anchor and Managing Editor Brian Williams, Bush discusses "What It Takes" to develop a comprehensive, bipartisan agenda for improving education. Interviewed by: Brian Williams, Anchor, "NBC Nightly News"
The Congressional Medal of Honor is this nation's highest award for acts of wartime valor. 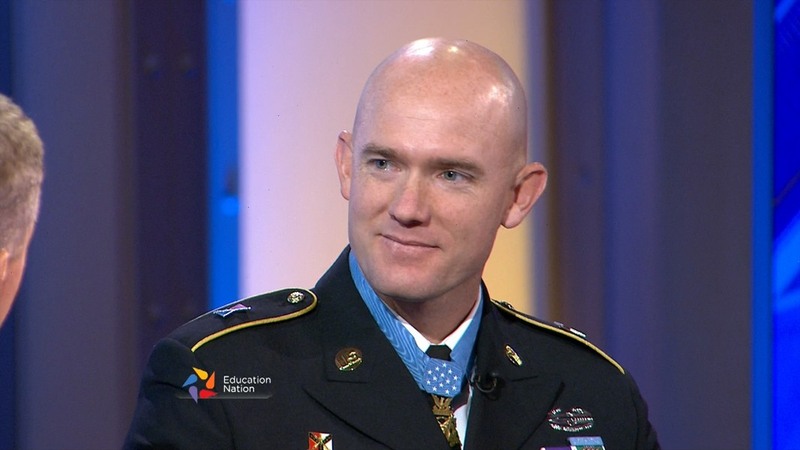 The Medal of Honor Foundation's character development program incorporates the ideals of the medal into middle and high school curricula, with the goal of promoting responsible citizenship. "NBC Nightly News" Anchor and Managing Editor Brian Williams talks with Medal of Honor Recipients Staff Sergeant Ty Michael Carter and Colonel Jack H. Jacobs. While some students find the support, guidance, and care they need within their immediate families, others must look elsewhere – to mentors, coaches, teachers, community leaders, and others. Caring adults and community programs can provide the consistency, encouragement, and accountability that students need to succeed. Across the country there are amazing stories of high-achieving schools in different communities. We talk to two authors whose recent work focuses on what makes schools great. Debates have raged in recent years over the best way to improve school districts–with some arguing for competition and choice to drive improvement and others for more investment in traditional public schools. 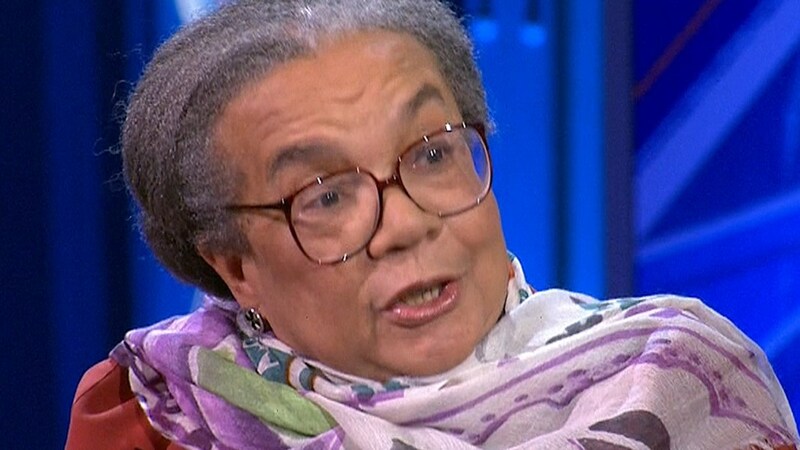 Two experts on school reform share their differing views on "What It Takes" to put urban schools on the path to success. 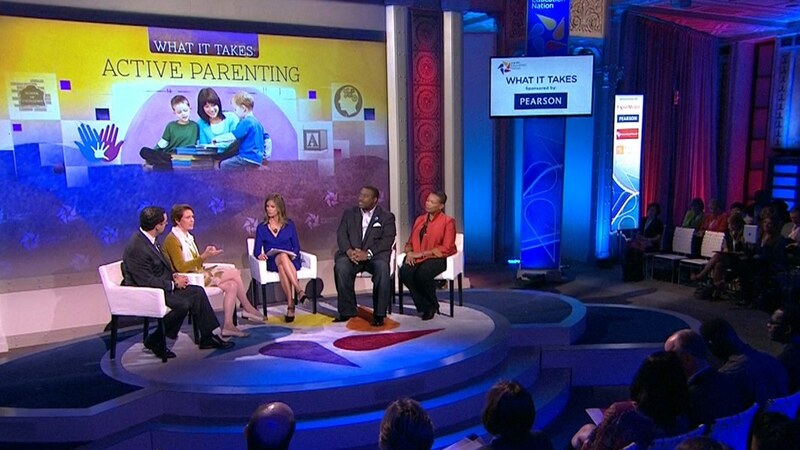 Over the 2013 Summit, Education Nation examined "What It Takes" for students to succeed. The fourth annual Summit closes with leading education journalists discussing their perspectives and experiences covering this critical story. Rehema Ellis, NBC News Chief Education Correspondent and Summit Host Erica Hill, NBC News "Weekend TODAY" Co-Host, close out the 2013 Education Nation Summit. 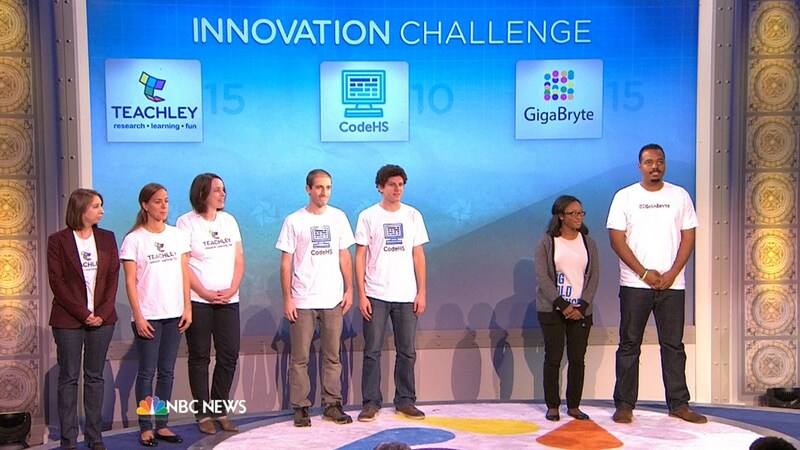 The third annual Innovation Challenge spotlights early-stage Ed Tech entrepreneurs. 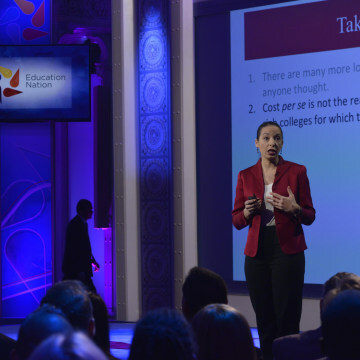 Three teams are tested through a series of competitions with teachers, students, and business leaders, culminating in a pitch contest live on the Summit stage. 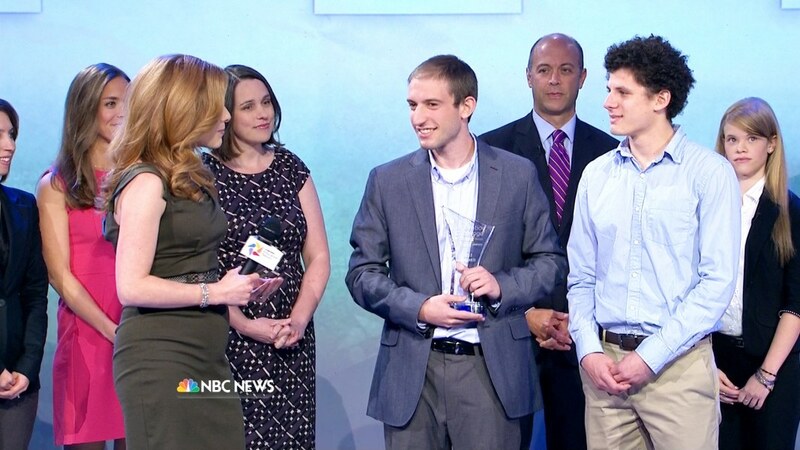 This year's winner, Code HS, walked away with a $75,000 prize awarded by Robin Hood. Pearson partners with educators in more than 70 countries to help people make progress in their lives through learning. Drawing on our deep experience, innovative technologies and world-class research, our educational products and services tackle the toughest challenges to improve achievement and expand access for learners of every age. University of Phoenix is constantly innovating to help working adults move efficiently from education to careers in a rapidly changing world. Flexible schedules, relevant and engaging courses, and interactive learning can help students more effectively pursue career and personal aspirations while balancing their busy lives. The Bezos Family Foundation supports rigorous, inspired learning environments for young people, from birth through high school, to put their education into action. Through investments in research, public awareness, advocacy and programs, the foundation works to elevate the field of education and improve life outcomes for all children. The College Board is a mission-driven not-for-profit organization committed to expanding access to opportunity for students. Founded in 1900, the membership association is made up of more than 6,000 of the world’s leading educational institutions and is dedicated to promoting excellence and equity in education. The Helmsley Charitable Trust aspires to improve lives by supporting effective nonprofits in health, education and human service, and a range of place-based initiatives. Since 2008, when the Trust began its active grant making, it has committed more than $900 million to a wide range of charitable organizations. Since 1988 Robin Hood has focused on finding, funding, and creating programs and schools that generate meaningful results for families in New York's poorest neighborhoods. Over its 25 year history, Robin Hood has distributed more than $1.25 billion to hundreds of the best New York City-based schools, soup kitchens, homeless shelters, job training programs, and other vital services. America’s Promise Alliance is the nation’s largest partnership organization dedicated to improving the lives of children and youth by raising awareness, supporting communities, and engaging in nonpartisan advocacy. 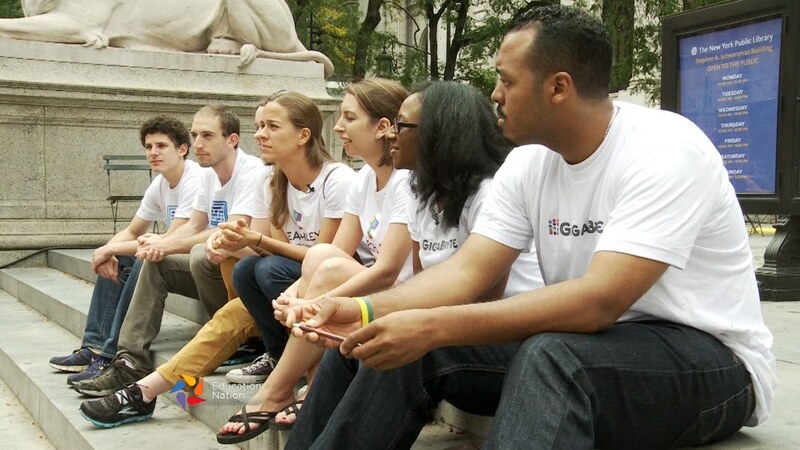 Through our Grad Nation campaign, we harness the collective power of our partner network to mobilize Americans to end the high school dropout crisis and prepare young people for college and the 21st century workforce. 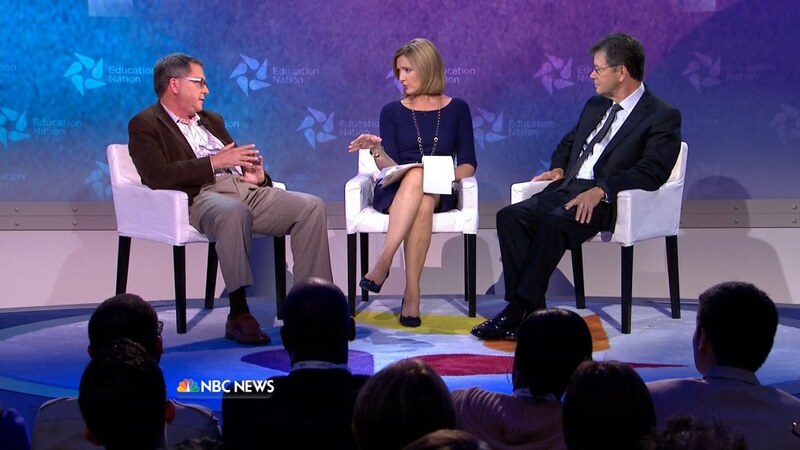 NBC Learn is the education arm of NBC News. We believe in the power of stories to engage 21st century learners and offer a new way to inspire students and empower teachers in and out of the classroom.